At this year’s prestigious Venice Architecture Biennale, which opened Aug. 27, Russia will be represented exclusively by a team from Skolkovo, Russia’s futuristic city-in-planning. RIR's Elena Shipilova spoke to Grigory Revzin, member of Skolkovo’s architecture-planning council, about what Skolkovo hopes to achieve at the exhibition. 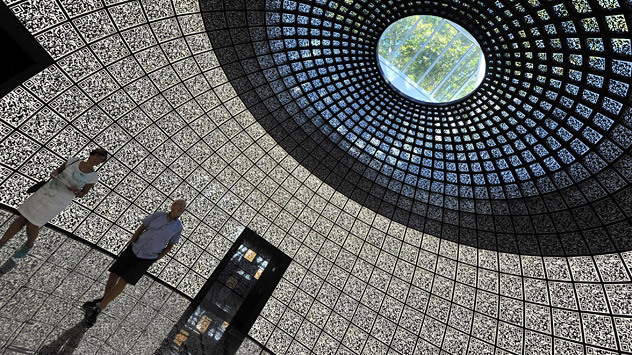 Russia & India Report: This year’s Venice Architecture Biennale will kick off Aug. 27. What will Russia be showcasing? Grigory Revzin: This year we will present the Skolkovo Innovation Center project. The display is truly amazing – our architects were trying to create a space that would balance between the physical and the virtual. We have never had such a sophisticated project before. The pavilion will have two stories. The ground floor will showcase a Soviet phenomenon – closed science towns that were inaccessible to ordinary citizens. The visitors will not only have a glimpse of the past but will also see the life that very few people lived in the Soviet Union. On the second floor, they will see the modern, accessible Skolkovo Innovation City, as if contrasted to the Communist secrecy of closed towns. RIR: Which projects and architects competed for the right to represent Russia this year? G.R. : The Ministry of Culture believes there should always be some large, national-scale project to represent Russia at the Venice Biennale. For instance, in 2004, when the reconstruction of the Bolshoi Theater and the Mariinsky Theater was launched, we presented the display “Two Theaters.” Although the Biennale is a modern arts exhibition and architectural monuments are, as a rule, not allowed there, the reconstruction project gave us that rare opportunity. The problem is that there are few nationwide projects that can compete at the exhibition – Sochi-2014, Russky Island, Greater Moscow, reconstruction of central St. Petersburg and Skolkovo. The Innovation City has brought together Russian and foreign professionals, and we thought it would be exciting to make use of this blend. Furthermore, we had to take finances into account. It costs about $1 million to build a pavilion. The Ministry of Culture pays for a third and, as a commissioner, I have to find the rest of the money. The Skolkovo Foundation was able to provide the required amount. Sponsorship is never the main criterion for us in choosing our competitor but it is important enough. RIR: Why are most national projects carried out by foreign architects – take Skolkovo, where the infrastructure is being developed by Japanese, Swiss and French firms? Are there no good Russian specialists? G.R. : Russian architects were “fed” exclusively by the former mayor of Moscow Yury Luzhkov. Our federal authorities have always opted for western specialists. I am always telling them that we have talented architects, let me bring someone. But they say: no thanks, we have not heard of any. For instance, when Dmitry Medvedev chaired the guardianship board of the Pushkin Museum in 2009, he wanted to assign the reconstruction of the museum to the British architect Norman Foster, simply because he knew the name. I tried to explain to him that Foster is just a brand, under which other people work; that the maestro spends just about seven minutes a year on each of his projects! Why encourage this approach? But I did not manage to change his mind. I became a member of the Skolkovo Foundation city planning council because I wrote a marvelous article about engagement of foreigners in the project, even though such projects should be used to promote the national architecture school. The situation enraged me – as if Russian citizens were not allowed to vote for their own president! As a result, they proposed that I hold an auction among Russian architects. Boris Bernaskoni has almost completed the first Skolkovo building, the Hypercube; the SPEECH Bureau of Choban and Kuznetsov is designing the D1 district; Grigorian’s Meganom Bureau is working on the D4 district; and numerous young Russian architects have been awarded contracts to develop residential quarters. Incidentally, this is another reason why I wanted to showcase Skolkovo at the Biennale. RIR: You are sometimes very critical of how the state approaches architectural projects. Why? G.R. : We tend to do many things half-heartedly. There is not enough consistency and accuracy; so, many excellent initiatives get corrupted. They decided at the economic forum in St Petersburg that a billion dollars of budget funds would be allocated annually during the coming decade, in order to reconstruct the city center. This is good money, but I am afraid it will not do the city any good. There is another difficult situation in St Petersburg, surrounding the Gazprom tower. Economically, it is a crucial thing for the city: you would have to be a fool to use such an attractive project to cause trouble between the municipal authorities and residents. Alexei Miller, the Gazprom CEO and a very intelligent man, had the idea that the 300-meter skyscraper would represent his company most adequately in the low-rise northern capital. They had him change his mind and shift the construction site, but at what cost? RIR: St. Petersburg was in danger of losing its status as a UNESCO world heritage site because of the Gazprom tower, wasn’t it? G.R. : That was not the worst problem. The Moscow Kremlin almost lost this status many times (for example, after the Palace of Congresses was build there), yet it did not suffer much. What is worse is that we often consciously destroy our historic legacy, allowing our buildings and city layouts to be ruined. As for UNESCO, it is a timid, bureaucratic organization that enjoys major contributions from Russia, which pays mostly to deal with internal discrepancies. When Luzhkov wanted world heritage site status for the Cathedral of Christ the Savior, UNESCO protested, but this is not what really matters. The main thing is that, if a site is protected by UNESCO, it automatically falls under the jurisdiction of both the Ministry of Foreign Affairs and the Ministry of Culture; and few would dare challenge both state institutions at once. But we should not use UNESCO as a boogeyman all the time. We need to deal with our problems independently.